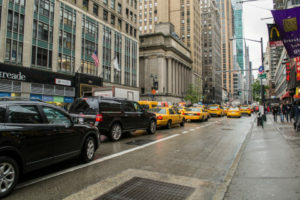 NASHVILLE, Tenn.–(BUSINESS WIRE)–The New York City Department of Transportation (NYC DOT) has selected TransCore to lead the initial design of its recently announced Connected Vehicle Pilot Deployment Program. When deployed, this project will integrate TransCore’s TransSuite® Traffic Management System technology with an in-vehicle device to further improve traffic flow, reduce accidents and improve pedestrian safety. Supporting Mayor Bill de Blasio’s Vision Zero initiative to eliminate traffic deaths by 2024, the Connected Vehicle program will equip approximately 10,000 cars, buses and trucks with devices that pull real-time information on road conditions and transmit it directly into the vehicle. This project is funded as part of the United States Department of Transportation’s Connected Vehicle Pilot program. TransCore will develop the Concept of Operations and Deployment Plan for the NYC DOT program. “Cities across the U.S. have always looked to New York for ideas that work in some of the busiest environments anywhere on the globe. We now have the incredible opportunity to lead the nation in unlocking the promise of Connected Vehicle technology in a live, real-world environment,” said NYC DOT Deputy Director of System Engineering Mohamad Talas. The new in-vehicle applications will notify drivers of speed, impending red lights, approaching pedestrians, adjacent vehicles and work zones. Drivers of buses and fleet vehicles will also be alerted to potential hazards, including bridge clearances, route restrictions and curve speed warnings. The Connected Vehicle project is the latest initiative to bring innovative transportation technologies to New York City. Its TransSuite traffic control system is the largest of its kind in the world, managing over 12,000 intersections. The award-winning Midtown-in-Motion project has modernized the city’s traffic management capabilities with the deployment of adaptive traffic signal control technologies that have improved travel times in Manhattan by 10 percent. TransCore is also working with the City on expanding the deployment of a new Transit Signal Priority pilot program that helps keep city buses on schedule. TransCore’s selection to lead this effort continues the company’s significant presence in the Connected Vehicle arena. TransCore staff have served on numerous working groups and committees to develop this groundbreaking industry. These include the Institute of Transportation Engineers (ITE) Connected Vehicle Task Force, and the Joint ITE/Intelligent Transportation Society of America (ITSA)/American Association of State Highways and Transportation Officials (AASHTO) Connected Vehicle Deployment Coalition.